Driving to work this past Monday, I was rather astonished to look at the sky and see what was clearly (in my mind at least) a cloud pattern resembling a fish. Maybe my lack of fishing is making me see things and go fish crazy, but it’s what I see. In fact, I even think it looks like a Steelhead chasing a school of small fish… making the aerial display even more fascinating due to our current season. Okay, I’ll stop and let you judge for yourself. 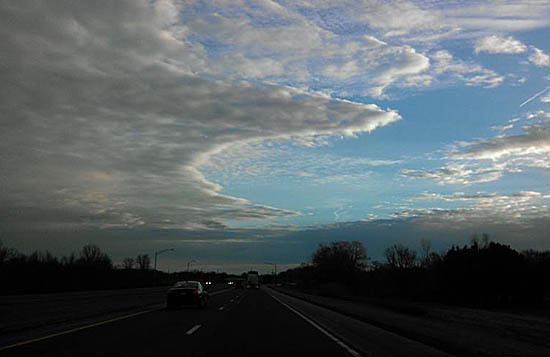 Fish in the sky?, or just a guy with ‘cabin fever’? I have to be honest and admit my wife says she doesn’t see it at all. At best, she simply will give me that maybe it “ever so slightly looks like a shark”. So even without her vote of confidence that this was even fish related, I’m posting this. I enjoyed seeing it and it was a bit of an awe-inspiring way for me to start my week.